A "boisterous protest" was scheduled for this evening. It didn't happen. And a good thing, too. The voice of fundamentalism, though often short on fact and long on rhetoric, tends to be shrill. The voice of reason, though sane, lucid, eloquent, tends to be soft. It is in the nature of the second to be drowned, and of the first to drown. The real triumph of this evening, thus, could well lie in the fact that the voice of reason was heard, and appreciated with frequent bursts of applause, by the audience at the Tischman Auditorium in the main building of The New School, on 12th Street, New York. Outside the school premises, the middle-aged Narain Kataria of the Hindu Swayamsevak Sangh and his followers - numbering all of 18 - chanted a few slogans, held up assorted placards, and flashed embarrassed grins at passersby wondering what the heck was going on. Inside, an audience of approximately 500 people, at $ 10 a pop, gathered for a staged reading of author and senior United Nations official Shashi Tharoor's novel, 'Riot'. For the uninitiated, a staged reading is essentially a dramatised version of a book or part thereof, in multiple voices. In this instance, four characters from the book - Ram Charan Gupta, Mohammad Sarwar, superintendent of police Gurinder Singh and district magistrate Lakshman were chosen. And voiced by, respectively, actress and parliamentarian Shabhana Azmi, actress and director Madhur Jaffrey, Tharoor himself, and Deputy Editorial Features Editor of the Wall Street Journal Tunku Varadarajan. 'Riot' - the novel - is a tale of love and its almost inevitable fictional concomitant, death, set against the backdrop of the Ram Janambhoomi agitation. In it, the author uses 12 different voices to tell his story and, inter-alia, to cast light on the troubled times. Michael Johnson Chase, International Program Director of the Lark Theatre Company, in tandem with the author adapted the book for the event. That is to say, he gave the central romance the miss in baulk, and made the canvas itself his tale. Thus on stage we had Shabhana Azmi playing the volatile Hindutva chauvinist Ram Charan Gupta. Ironical bit of casting that, for the handful of protestors outside had in their slogans been characterising her as rabidly anti-Hindu, and a friend to Muslim jehadis and the Taleban. Tunku Varadarajan, known for his acerbic columns, was another instance of classic miscasting - as the soft-spoken, rational district magistrate trying to do the right thing. Tharoor, with his booming base, played the expletive-spouting, hard-drinking top cop. And Madhur Jaffrey rounded off the ensemble as the sarcastic, witty, yet always sensible Muslim professor making a case for his -- and his community's - essential Indianness. It was a structured retelling, kicking off with Azmi talking of the historical injustice of Babar's demolition of a Hindu temple to erect a Muslim mosque on the land revered as the birthplace of Lord Ram, and making a case for the land to be reclaimed, and a temple to Ram erected in place of the mosque. Varadarajan as the middle-of-the-road official followed up with an argument against the increasing climate of intolerance. 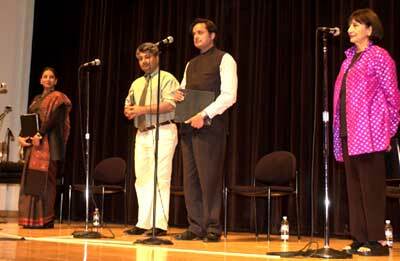 "The phrase Hindu fundamentalist," he said, "is a contradiction of terms, because Hinduism is a religion without any fundamentals" - a line that, in fact, finds place in Tharoor's earlier work of non-fiction, India: From Independence to the Millennium and which, like a few others, were transplanted into this performance. Jaffrey in her turn gently mocked the Hindutva brigade's claims to historical sanction, and rounded off with the eminently quotable: "Build Ram in your hearts because if he is there, it little matters where else he is." And Tharoor rounded off by talking of his increasing headache - to wit, maintaining the peace. From that point on, all four performers blended literature and dramatics into an escalating tale of Hindu belligerence and Muslim angst, mixed with the attempts by Authority in the form of the DM and the cop to restore peace. The production was full of lines of startling eloquence, with Jaffrey drawing the most laughter, and applause when she defined the temple agitation as "The reclaiming of history by those who believe that at one point they had been written out of the script" or when she pointed out that it was Islam, in a way, that had led to the nationwide resurgence of Ram as an object of veneration, saying, "The role of Islam in the sanctification of Ram is a PhD thesis someone should do - provided he or she is adequately insured." But Azmi proved the scene-stealer. At one point, as the tension built, Azmi as Ram Charan Gupta told of preparations for the next morning's Ram Shila procession in the town of Zalilgarh, where the action of the novel is set. Of how two youths painting slogans on the wall were set upon by two Muslim youths, attacked with knives and hacked. As Azmi spoke, her voice trembled with the startled surprise of the two young Hindus, blazed with the anger of the Muslim attackers, turned hoarse and broke in anguish as the attack put the victims down in a pool of their own blood, and throbbed with raw emotion bordering on tears as she spoke of how one of the boys, slated to get married within a month, had his face crudely disfigured. Sans props, sans makeup, sans a helpful director standing in the wings yelling 'Cut!' till she got it inch perfect, Azmi yet produced a moment of high, gripping drama. And Tharoor acknowledged her virtuosity when, in the question-answer session following the reading, he spoke of how Azmi had performed the role of Hindu fundamentalist, espousing the character's views "with such fervour that for a moment, even I was convinced!" The performers built up towards the inevitable denouement - the riots and the bloodshed that followed in the wake of the Ram Shila processions. And ended with a retelling of an old Hindu tale relating to one man's quest for truth and his ultimate discovery that Truth is, ultimately, what you make of it. The evening had begun with a bow to the secular ethos, when Ishita Ganguly sang 'Raghupathi Raghava Raja Ram', segueing immediately into 'Allah ho..." It ended with Azmi reading a poem of rare eloquence by her recently departed father, the poet and lyricist Kaifi Azmi. Inside, people ignored the organisers' repeated pleas to vacate in order that the auditorium could be shut down for the night and queued up to shake hands with the four performers, and with the director. Outside, where three hours earlier a motley crowd had hung around, brandishing signs reading 'Shabana is a Communist, deport her!' and 'Shabana has not condemned the ethnic cleansing of Hindus and Sikhs in Kashmir', there was silence. And peace. And in between the energized atmosphere inside and the silence outside, you were left with a thought: What if, one day in our country, they threw a riot - and nobody came?